Work on my jacket continues...slowly. 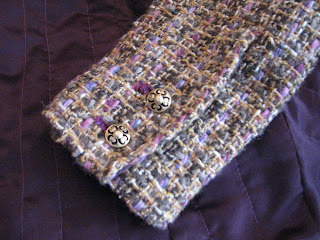 While focusing on the sleeve vent buttonholes, I once again became paralyzed by fear -- the fear of cutting into the tweed boucle and ruining a sleeve. Probably not true fear, maybe just anxiety. Even though I practiced a few times on scraps, I was hesitant to pick up my scissors and cut into the thread-marked sleeve. So the jacket sat unworked for a few days until I told myself "this isn't brain surgery" and finally cut into it. I should have approached it as though it was brain surgery. The first hand-worked buttonhole came out very nice. Not sure what happened during the second -- maybe I drifted off to sleep or was distracted by the dogs or the kids or the doorbell -- I ended up tearing it out. The the third and fourth were even nicer. Whether it was more practice or just paying attention to my fingers, I can't be sure, but I am happy with the outcome. I really enjoyed the hand-worked method (with a faux bound buttonhole on the inside). I was disappointed that I didn't give myself room for buttonholes down the front of the jacket, so this was my way of redeeming myself. I used purple silk buttonhole twist and a fairly thick cord for gimp. When I initially constructed the sleeves (in late 2011), I hand-stitched a 2" wide strip of organza into the end of the sleeve. It came in very handy as a stabilizer for the bottom buttonhole, and I wish I would have extended the width 2 or 3 more inches to reach the second buttonhole. All that's left is the trim and the chain! I just can't believe it's almost finished. I had hoped to finish it over the long weekend, but life (and mending) got in the way, so it will be an evening project this week.